Peptide CNFELLHFPRDHSN, corresponding to amino acid residues 157-170 of human zinc-activated channel (ZAC) (Accession Q401N2). Extracellular, N-terminus. Reconstitution 50 µl or 0.2 ml double distilled water (DDW), depending on the sample size. 1, 2. Anti-Human Zinc-Activated Channel (ZAC) (extracellular) Antibody (#AZC-001), (1:200). 3, 4. Anti-Human Zinc-Activated Channel (ZAC) (extracellular) Antibody, preincubated with the control peptide antigen. ___ Cells + Anti-Human Zinc-Activated Channel (ZAC) (extracellular) Antibody (#AZC-001), (5-10 µg/1x106 cells). Cell surface detection of Zinc-Activated Channel (ZAC) in human intact living pancreatic adenocarcinoma (PANC-1) cells. 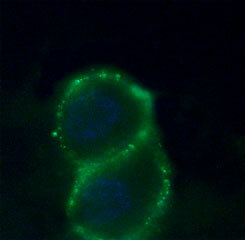 Extracellular staining (green) of cells with Anti-Human Zinc-Activated Channel (ZAC) (extracellular) Antibody (#AZC-001), (1:25) followed by goat anti-rabbit-AlexaFluor-488 secondary antibody. DAPI is used as the counterstain (blue). Davies, P.A. et al. (2003) J. Biol. Chem. 278, 712. Houtani, T. et al. (2005) Biochem. Biophys. Res. Comm. 335, 277. Over forty homologous proteins belong to the superfamily of ligand-gated ion channels. These members are broken down into different subfamilies, for example: acetylcholine, serotonin and glycine receptors. A new member has been added to this superfamily – ZAC (Zinc-Activated Channel) which is expressed in human and dog but not in rodents1. Like all other ligand-gated ion channels, ZAC has four transmembrane domains and extracellular N- and C-termini. As its name states, the channel is activated by high concentrations of zinc. ZAC mRNA was found to be expressed in placenta, spinal cord, stomach, and fetal brain1. In another study, ZAC was identified using a computer-assisted program and was detected in similar areas (including pancreas and kidney), but also displayed minor discrepancies2. Being that the channel is expressed in human and dog, deciphering its cellular/physiological functions will be challenging. Click here to receive a 50 µl free trial sample! Anti-Human Zinc-Activated Channel (ZAC) (extracellular) Antibody (#AZC-001) is a highly specific antibody directed against an epitope of the human protein. The antibody can be used in western blot, immunocytochemistry, and indirect flow cytometry applications. The antibody recognizes an extracellular epitope, and is thus ideal for detecting ZAC in living cells. It has been designed to recognize ZAC from human samples only.